The Pioneer Woman Cooks . Ree Drummond was a Southern California college graduate with plans to move to Chicago and start law school when she met an Oklahoma cattle rancher. She married “Marlboro Man,” and moved to Oklahoma, and set about acclimating to ranch life. In 2006 Ree Drummond started blogging about cooking, food, and ranch life as The Pioneer Woman Cooks. The basic Web site features well-crafted lovely recipes that are carefully illustrated with photographs and step-by-step illustrations. Ree Drummond writes in a voice that might have been that of your sister or your best friend, and that initial site grew into a large and vibrant community of six related sites and a community portal. In 2009, Harper Collins published a Ree Drummond cookbook. 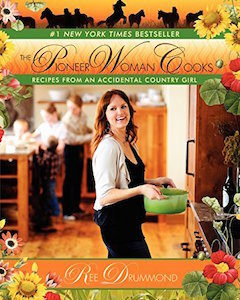 The Pioneer Woman Cooks is a New York Times best-selling cookbook. The cookbook is directly related to her blog, and includes not only clearly written recipes for fabulous food, but Ree Drummond’s own step-by-step photos, and easy-t0-follow instructions. I should note that while there is considerable overlap between the site and the recipes, the cookbook also features recipes that aren’t on the Web site, and vice versa. The cookbook features basic home-cooked comfort food and hearty food for families, but it’s food that tastes good. There are recipes for the kind of food you’d expect to find on a working ranch, where people rise early and work hard and need protein and substantial calories to get through the day. So you’ll find breakfast dishes for people preparing for a day of hard work, like Migas (scrambled eggs with jalapeños, cheddar-cheese, onions, and freshly fried squares tortilla crisps), but you’ll also find easy to follow recipes for muffins, and French Breakfast Puffs. Dinner is there too, ranging from Crispy Fried Chicken, Rib-Eye Steak with Whisky Cream Sauce, Creamy Mashed Potatoes, and Simple, Perfect Enchiladas. Ms Drummond even includes a dinner for a girls night out party from Sangria, to Roasted Beef Tenderloin and Burgundy Mushrooms. I want to call particular attention to the recipes for Pico de Gallo, Chili, Pot Roast, and Pizza dough, because they’re particularly tasty, and easy to follow. Also: don’t miss her Cinnamon Rolls. Really. That one recipe might just be worth the price of the book, though the enchiladas are a close second. This is a perfect cookbook to give someone just beginning to live on their own, someone who’s just become interested in cooking, or as a gift to an international friend with an interest in American food.